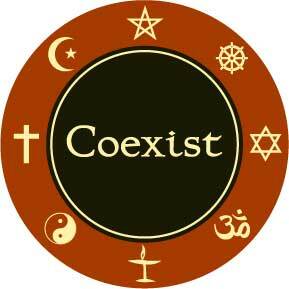 We have all seen the bumper sticker or logo that features all the religions of the world, and spells out the word, coexist. This sounds like a wonderful, utopian idea. If only all the religions of the world could emphasize their similarities, and stop focusing on their differences, perhaps we could have peace and security. I believe the Holy Bible gives a picture of this happening, but the outcome is not what people expect. A charismatic leader, who brings a message of peace and coexistence, may be ready to emerge. What might bring us all together? A doctrine of love, and of working together to finally produce peace and happiness? Is man truly capable of such a religion? And what would this one world religion look like? Will it be harsh and authoritarian? Certainly not at first. I believe it will be as gentle as a dove, and appear to be full of goodness and truth. 2 Corinthians 11:13-1513 For such are false apostles, deceitful workers, transforming themselves into the apostles of Christ.14 And no marvel; for Satan himself is transformed into an angel of light.15 Therefore it is no great thing if his ministers also be transformed as the ministers of righteousness; whose end shall be according to their works. How can we possibly avoid such deception? It will not be easy. Mathew 24: 24-25 24 For there shall arise false Christs, and false prophets, and shall shew great signs and wonders; insomuch that, if it were possible, they shall deceive the very elect.25 Behold, I have told you before. Here we have the Lord Jesus describing false Christs, and false prophets, showing great signs and wonders, and Paul describes them as appearing as ministers of righteousness. Jesus also added, if it were possible, they shall deceive the very elect. Paul tells us their end will be according to their work. I believe this is a major key in recognizing them. They will be preaching a false gospel of salvation, for the planet, and for individuals, through works. This is why a Christian who holds to the truth, that salvation comes only as a gift through faith in the finished work of our Lord Jesus on the cross, will be persecuted. We will be pictured as part of the old age, an age when religious differences brought about war and suffering. The world will be at peace under this new religion, but it will not be a genuine peace, nor a lasting utopia. 1 Thessalonians 5:2-4 2 For yourselves know perfectly that the day of the Lord so cometh as a thief in the night.3 For when they shall say, Peace and safety; then sudden destruction cometh upon them, as travail upon a woman with child; and they shall not escape.4 But ye, brethren, are not in darkness, that that day should overtake you as a thief. The world will be at apparent peace and safety, and how could anyone not want to be on board, with such miraculous results? Again those that are unable to see the light, Satan himself is transformed into an angel of light, must be dealt with. John 16:1-3 1 These things have I spoken unto you, that ye should not be offended.2 They shall put you out of the synagogues: yea, the time cometh, that whosoever killeth you will think that he doeth God service.3 And these things will they do unto you, because they have not known the Father, nor me. Revelations 6:9-11 9 And when he had opened the fifth seal, I saw under the altar the souls of them that were slain for the word of God, and for the testimony which they held:10 And they cried with a loud voice, saying, How long, O Lord, holy and true, dost thou not judge and avenge our blood on them that dwell on the earth?11 And white robes were given unto every one of them; and it was said unto them, that they should rest yet for a little season, until their fellowservants also and their brethren, that should be killed as they were, should be fulfilled. Before they would go so far as to put a backward Christian to death, this benevolent religious and political world power, will give all a chance to show their allegiance to its wonderful rule of peace and prosperity. Revelations 13: 11- 18 11 And I beheld another beast coming up out of the earth; and he had two horns like a lamb, and he spake as a dragon.12 And he exerciseth all the power of the first beast before him, and causeth the earth and them which dwell therein to worship the first beast, whose deadly wound was healed.13 And he doeth great wonders, so that he maketh fire come down from heaven on the earth in the sight of men,14 And deceiveth them that dwell on the earth by the means of those miracles which he had power to do in the sight of the beast; saying to them that dwell on the earth, that they should make an image to the beast, which had the wound by a sword, and did live.15 And he had power to give life unto the image of the beast, that the image of the beast should both speak, and cause that as many as would not worship the image of the beast should be killed.16 And he causeth all, both small and great, rich and poor, free and bond, to receive a mark in their right hand, or in their foreheads:17 And that no man might buy or sell, save he that had the mark, or the name of the beast, or the number of his name.18 Here is wisdom. Let him that hath understanding count the number of the beast: for it is the number of a man; and his number is Six hundred threescore and six. Verse 13-14 states again, this religious power will deceive them that dwell on the Earth, through the miracles it performs. Verse 15 states, all that would not worship the beast, true Christians, should be killed. And finally, the mark of the beast, would have to do with the number 666. Exodus 31: 15 Six days may work be done; but in the seventh is the sabbath of rest, holy to the Lord: whosoever doeth any work in the sabbath day, he shall surely be put to death. We are in the sabbath day, Jesus has provided a rest for his people,all those who believe he has provided salvation, through his finished work on the cross. The world will be working out their own salvation. Hebrews 4:10-11 10 For he that is entered into his rest, he also hath ceased from his own works, as God did from his.11 Let us labour therefore to enter into that rest, lest any man fall after the same example of unbelief. God stated back in Exodus, whosoever doeth any work on his sabbath , shall surely be put to death. This will be the challenge we face. This is the second death, that those that fail to receive the greatest gift ever given, will experience. We may have to endure for a moment, the first death, at the hands of the beast. But fear not. Luke 21:16-19 16 And ye shall be betrayed both by parents, and brethren, and kinsfolks, and friends; and some of you shall they cause to be put to death.17 And ye shall be hated of all men for my name’s sake.18 But there shall not an hair of your head perish.19 In your patience possess ye your souls. ← God is not punishing sinners at this time. Thank you. I really appreciate your feedback and encouragement. I think perhaps you misunderstand the concept. I don’t think the idea is to melt all the religions into one. I think there is a much less (unfortunately) utopian idea here and that is to just get along. Thank you for your comments. You are right, I may have read more into it then was intended. Sometimes I look at Bible prophecy and may try and make things fit into what I believe will take place, before it is time. Thank you for your insight. God Bless. please, if you cold with mentioning the page number and the text number. Hi Alawi, sorry I took so long to respond to your question, I was unable to get on- line for the last week or so. You have a good question. Here is the first scripture that came to mind. Matthew 5:43-45 Ye have heard that it hath been said, Thou shalt love thy neighbour, and hate thine enemy.